You’ve no doubt heard about dental implants — they’re considered the premier tooth replacement option because of their life-likeness and durability. More accurately described as a “root” replacement, the implant’s titanium post imbeds in the jawbone where bone cells grow and adhere to it to form a strong union over time. A porcelain crown is either cemented or screwed to the metal post to produce a life-like replacement that functions — and looks — like a real tooth. 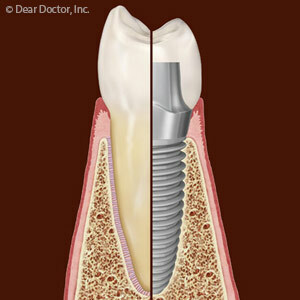 But did you know implant technology is useful in other situations besides replacing an individual tooth? Here are 4 ways implants can be used to improve your mouth’s function and your smile. Fixed Bridgework. Replacing multiple teeth with separate implants for each one can be quite expensive. But a fewer number of implants can also be used to support bridgework. A three-tooth bridge, for example, can be attached to and supported by two implants; bridges of ten or more crowns can usually be supported by four to six implants. Removable overdentures. Traditional partial or full dentures are an affordable restoration for multiple or total tooth loss, but they have one major drawback: they can’t stop, and may even contribute to, bone loss in the jaw. This leads to poor denture fit over time that can affect both comfort and nutrition. An implant-supported denture using two to four implants that connect with the appliance to hold it in place can help reduce bone loss. Fixed implant-supported dentures. This option may work well for patients who have already incurred extensive bone loss. Supported by four to six implants, this denture can be fixed into place to provide for full mouth function and to provide support for facial structures like the lips or cheeks. Orthodontic anchorage. Some tooth-movement treatments can be a challenge — the key is to move only the teeth intended for movement while making sure adjacent teeth don’t. Implants in the form of temporary anchorage devices (TADs) imbedded in the jaw can be used as anchorage points that isolate only those teeth that need to move. These devices can streamline and even speed up treatment time and are then removed after orthodontic treatment is complete.